We began our Katahdin Sheep herd with non-registered sheep but have added registered Katahdin ewes to our farm. We are close to our goal of an entire herd of registered Katahdin sheep. We currently have 15 registered Katahdin ewes. Our Katahdin ewes are registered through Katahdin Hair Sheep International. Our herd of Katahdin ewes are proven mothers. They successfully nurse triplets and even quadruplets through pasture management. If you are seeking Katahdin sheep for a pasture based system, then our stock would be a great choice. We sell both registered Katahdin ewe and Katahdin ram lambs. Please visit our Sheep for Sale page to inquire about available sheep. Ice, was breed by Stablerock Katahdins in Kentucky. His bloodline includes Cannonball Express, Mr. Big Stuff, and Prime Time. 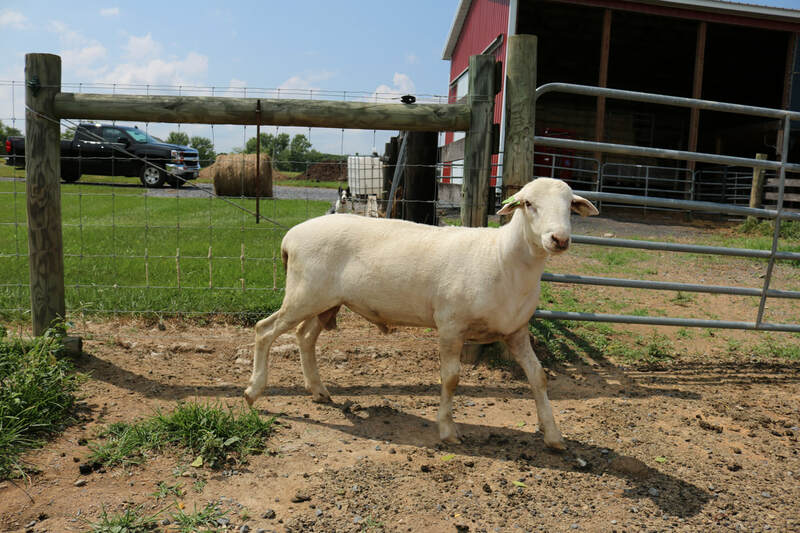 Ice is a certified RR ram, that has great length, is well muscled, and has a beautiful straight back. His first round of lambs looks fantastic and had excellent weight gains.